One of the main items I planned on getting when I attended IMATS NY 2014 this year was the new Make Up For Ever HD Cream Blush, but instead of just grabbing one I ended up with 4! (I had to force myself to stop lol). MUFE HD Blush has a light, creamy texture in the pan that applies easily and quickly becomes a matte/semi-matte powder-like finish. It is blend-able at either stage so you don’t feel like you have to race against time to get it right. The color is rich and extremely pigmented, but you can easily apply it as a subtle wash of color or be bold and get true-to-pan color. It retails for $26 and comes in a small compact with a mirror. I found that application was easy regardless of what method you choose (fingers, brush, and Beauty Blender are the ways I used) but I found my favorite application choice was with my MAC 128 split fibre brush. What I love most about these is the fact that they don’t feel heavy on my skin. 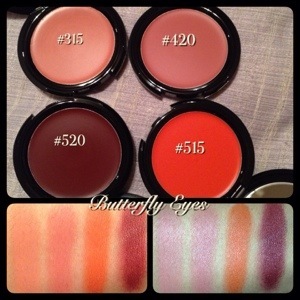 I’ve never been a huge fan of cream blushes but these have definitely changed my mind. They also stay put without need for touchup. Each color I’ve been able to wear for at least 9 hours without any fading. And as intimidating as some colors may look in the pan (#515 and #520 for example) they can be applied subtly or softened with a lighter color if you want to. I will definitely be adding more of these to my kit collection! Here is a pic of me wearing #515 softened with just a touch of #420. 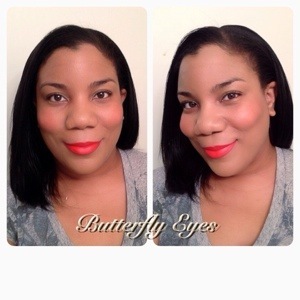 This entry was posted in Blush, Make Up For Ever, Product Reviews and tagged Cream blush, HD blush, Make Up For Ever HD Blush #315, Make Up For Ever HD Blush #420, Make Up For Ever HD Blush #515, Make Up For Ever HD Blush #520, Make Up For Ever HD cream blush. I bought two blushes at Imats in 515 and 510.I wished I bought the darker blush to in 520. I am going to place over NARS Taj Mahal over it. You should definitely get it! I think this combined with Taj Mahal will be gorgeous! No I have the orange one I just don’t have that dark one. Oh lol. Sorry I misunderstood.